Cuisinart 22 Inch Griddle Center Review: A Good Buy For a Fun Griddle! Cuisinart is making moves to get out of the kitchen and start cooking outdoors. 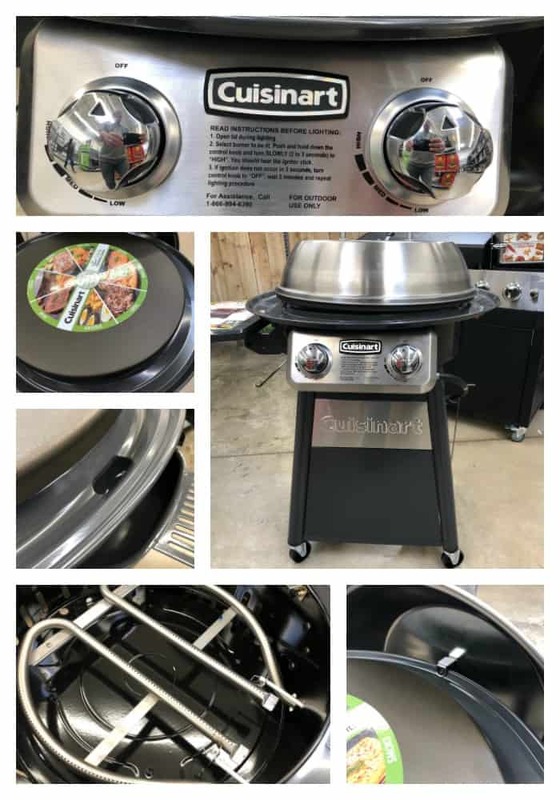 Cuisinart has introduced a line of smokers and grills that are of dubious quality but their latest introduction, a 22 inch griddle center is pretty awesome! What Is The Griddle Center? The Griddle Center is a circular flat top grill heated by dual burners that deliver up to 30,000 btu/hr of heating power. The griddle is equal parts an outdoor cooking utensil and entertainment center. Cooking on a griddle is always fun and the 360 degree design lets people gather around the griddle and either watch the action or join in themselves. You can cook just about anything on a griddle and the included lid makes steaming and baking pretty easy. The Griddle Center has a 360 degree grease tray around the griddle that drains into a grease trap at the back. The griddle is made of a rolled steel plate that is about 1/4 inch thick and has three mounting stands on the back to hold it above the dual burners. There are quite a few reviews for the Griddle Center on Wal-Mart’s website and they are all extremely positive. In general people liked how even the griddle cooks, that it doesn’t take up a lot of space and that the little features like the side table and paper towel holder are well thought out. The griddle is easy to clean, easy to move and has a pretty nice price point for a product that carries the Cuisinart badge. Here is the video that Cuisinart put together to highlight this product. I am a big fan of cooking outside on a griddle. And while I like the Cuisinart product there are a few others that you should look at before you pull the trigger on this one. Arteflame sells circular wood fired griddles that are amazingly beautiful and make for great party centerpieces. 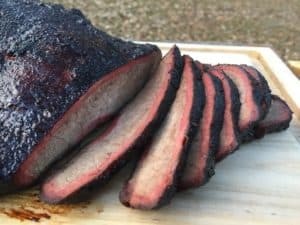 The grills are available as stand alone cookers or, if you are looking for a more affordable option, as drop in inserts for Weber kettle grills. 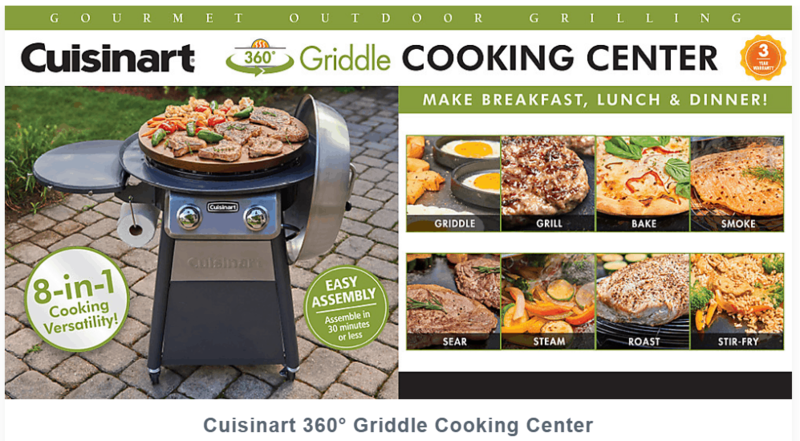 The Arteflame griddles are in a whole other price range than the Cuisinart but are worth a look. Here is a full review on the Arteflame griddles. There are two design issues with the Cuisinart griddle. The surface area of 340 square inches is a bit on the small side and food can slide off into the grease tray since there is no guard lip on the edge of the griddle. You can get around these issues by buying either a 28 or 36 inch Blackstone griddle. The Blackstone griddles are the more traditional square griddles and they have a fanatical following. You cannot go wrong if you buy a Blackstone.